UXPin recently released their 2017-2018 Enterprise UX Industry Report. 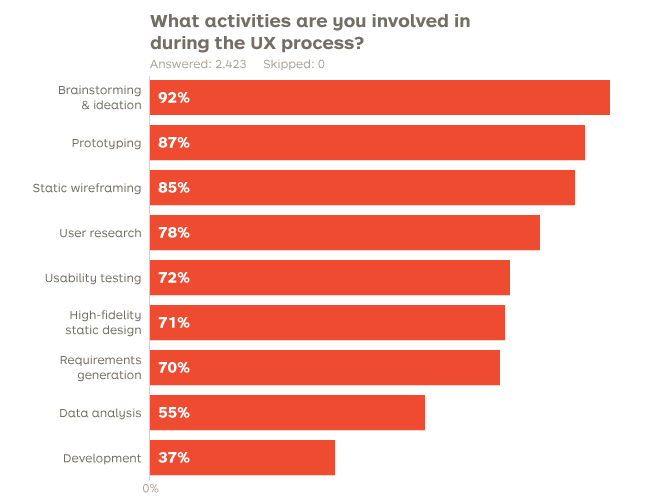 The report is structured around 3,157 survey responses they received asking about the state of the field of UX in enterprise settings. Having access to all this data is definitely exciting, and the people over at UXPin did a great job of analyzing it. While reading through the results and findings, we realized that we were familiar with some of the challenges noted. Additionally, we thought we could reflect on certain points not covered in the UXPin article. 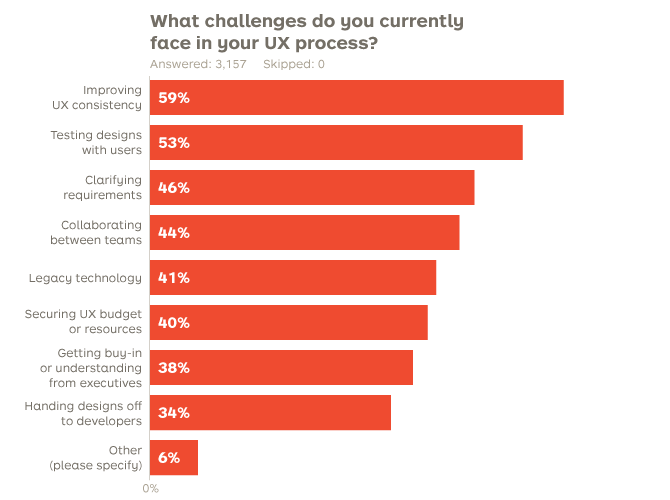 Improving UX consistency (59% reported this challenge): Improving consistency is a hot topic in the design community right now, and this was apparent in the survey. Something we strongly recommend is having a persistent UX advocate involved throughout the entire production process. Creating design systems is also a step towards overcoming this challenge and we touch on this in our Atomic Design blog post. We’ve also been incorporating Object-Oriented UX in our design process. Both of these methods describe ways of trying to anticipate which components your product will need in order to be successful and to reuse and adapt those components whenever possible. Testing designs with end-users (53% reported this challenge): We recognize that we work in a fast-paced industry. Because of this, it can be hard to find time, let alone funding, to run multiple usability tests. We also know that you can’t have UX without the User! To that end, we wrote a blog post describing ways we have found to get the most out of our testing sessions. Collaborating between teams (44% reported this challenge): This is something we are continually working on here at Cloudberry. Over the past couple of years, we have fine-tuned our collaboration toolbox and are in a place where cross-team workflows, handoffs, and reviews are seamless. In fact, we are so happy with the collaboration tools we use we wrote a blog post and hosted an in-depth webinar about the workflow and software. One of the tools we discussed, Zeplin, is what we use to handoff our designs to developers (34% reported this as a challenge). It automatically pulls fonts, colors, spacing, and sizing from your comps and displays the information in a webapp with CSS snippets. or sometimes it’s useful to whip up a quick prototype just to prove to yourself that something will actually work! UX design is a relatively new field, even more so in enterprise settings. So it’s not surprising that we see these growing pains as it becomes more popular. Fortunately, our community is strong, vocal, and made up of creative thinkers. Every day there are great articles posted, new tools being released, and new findings being published. We’re doing our best to keep up with all of it, and as we find things we like we’ll be sure to publish them here!